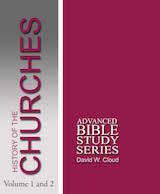 The following is excerpted from A History of the Churches from a Baptist Perspective? We measure church history by the Bible, which is the sole authority for faith and practice (2 Tim. 3:16-17). (It is able to make the man of God perfect, which means that nothing else is necessary.) The Bible is the key to understanding church history properly. For example, we know the difference between true and false Christianity and can rightly measure events such as the Crusades and the Protestant Reformation. 2. The value of church history. a. It is spiritually challenging. Studying the faith and sufferings of the saints of old can be challenging to one’s spiritual life. For example, we see the great price that has been paid to preserve the true faith and the Bible. We see this in 2 Cor. 9:2, where the example of the Corinthians in giving stirred up others to do the same. b. It encourages faith in God. In history, we see the hand of God (Dan. 2:20-21). He preserves the Scriptures, preserves the true Christian faith, helps His people, controls the events of history. He is working all things together for His glory toward His objective of putting Christ on the throne of the universe (Eph. 1:9-10). c. It helps us understand our times. It is impossible to understand the present unless one understands the past. For example, we cannot understand the Roman Catholic Church, Protestantism, Pentecostalism, Baptists, Evangelicalism, or Fundamentalism unless we know history. d. It helps protect us from doctrinal error. There are no new heresies, just old ones revived and revised. As we become familiar with old heresies, we can better discern the nature of modern heresies. e. It helps us understand Biblical prophecy. Prophecy is best understood as it unfolds, and we see the unfolding of prophecy throughout the Church Age. For example, we see the development of apostasy, the Roman Catholic Church, and the revived Roman Empire. f. It provides a wealth of material for sermon and teaching illustrations. g. It fosters analytical thinking and the development of keen spiritual discernment. Good church histories help the student learn to analyze statements and situations from a biblical standpoint. The student of history learns that deception is put forth under the guise of truth and that only through the exercise of keen discernment can one be protected (Heb. 5:14). Consider David Benedict’s evaluation of the charges commonly brought against the Donatists or William Jones’ evaluation of the charges against the Waldenses by the Catholics. These men reveal the truth about these people and redeem their history from the slanders of their enemies. h. It encourages balance in thinking. As we study history, we see the things that are most important and the things that are less so. All of the churches of history have had imperfections and faults, as have all of the influential leaders, but we must judge them by the more important characteristics of truth. Is that not how God judges the Old Testament saints? He includes them in His “faith hall of fame” in Hebrews 11 and holds them forth as our examples, but each of the individuals in this hall of fame had flaws. This is not to say that we are to overlook sin and error. It is simply to say that we need to be careful that we do not become focused on some relatively minor issue and thus lose sight of the bigger picture. “[The study of church history] tends to elevate and enlarge our views beyond the petty bounds of personal, sectarian and local interests; to discourage bigotry, and moderate controversial bitterness, without impairing our attachment to the truth itself; and to suppress crude innovations and absurdities, both in theory and in practice, by showing that the same, in substance if not in form, have been canvassed and exploded centuries ago” (Prof. J. A. Alexander, cited in History of the Church of God from the Creation to A.D. 1885, Preface, p. viii). 3. There is no perfection in church history. Because man is a fallen sinner, moral perfection cannot be found anywhere in human history, apart from the life of Jesus Christ. Every group, every movement was imperfect. We see this in Israel’s history, and we see it in the first churches. In the apostolic reproofs in the Epistles and in Christ’s messages in Revelation 2-3 we see that the early churches were far from perfect. 4. The record of most Bible-believing Christians does not exist. We don’t know everything we would like to know, but God has preserved for us what we need to know. a. In many cases the record was never recorded. The churches that are the busiest in the Lord’s work have the least time to make a record of their activities. b. Much that once did exist has been destroyed. The Roman Catholic Church ruled Europe for 1000 years and she made every effort to obliterate the record of her enemies. Thus, very little exists by way of a literary record of New Testament Christians of the first 1500 years of church history. c. The true record has often been fogged over by Rome’s legends, so that it is difficult to discern truth from legend. As historian James Wylie observed: “Not only are all contemporary records, such as the men of their own day would have given, wanting, but there hangs between us and these remote evangelists a cloud of fables and prodigies, the creation of men who lived long after these early labourers had gone to their graves, and who neither sympathized with their pure spiritual aims nor were able to rise to the conception of the simple greatness of their characters. The men and the events of those days look out upon us from a legendary fog” (Wylie, The History of the Scottish Nation, 1896, chapter 15). 5. Many Christian groups are known by the names of their leaders, but that does not mean that they followed a man. Names such as Hussites or Wycliffites were usually given to them by their enemies and were not what they called themselves. 6. The various groups of Christians known in history were not necessarily organized movements. When we read of the Novatians, the Paulicians, the Waldensians, the Lollards, etc., this does not mean that the churches known by those names were actually yoked together in some sort of denominational structure. Those are simply general terms by which various Christian groups were known, usually by their enemies. We have the same situation today. Terms such as Baptist or fundamentalist or evangelical or charismatic are general terms that encompass a wide variety of churches that often have no organizational association. 7. There was much variety within various groups of Christians. Terms such as Waldensian, Albigensian, and Lollard were broad names that encompassed many types of churches. There were Waldensian churches, for example, that practiced believer’s baptism, while others were pedobaptists. Even today, terms such as Baptist encompass all sorts of doctrine and practice. There are seventh-day Baptists, Reformed Baptists, charismatic Baptists, modernistic Baptists, denominational Baptists, associational Baptists, and independent Baptists, to name a few. There are even Baptists who don’t require believer’s baptism for membership. 8. The term “heretic” in church history can refer to false teachers or to true believers. A heretic by the Scriptural definition is one who teaches doctrine contrary to the Bible, but according to the Roman Catholic Church, a heretic is one who teaches doctrine contrary to Rome. The Catholic Church condemned multitudes of Bible-believing Christians as “heretics” and persecuted them. 9. The story of church history is the story of a continual process of apostasy and separation, decline and revival. Those who think it is wrong to judge doctrine and separate from error do not know their Bibles and have not learned the lesson of church history. Had it not been for those who judged doctrine and separated from error, there would be no true churches today. Praise God for the true heresy fighters and separatists of history by whatever name they were called! Churches do not remain sound from generation to generation into perpetuity. They descend into apostasy, sometimes within one generation. We see this even in the churches founded by the apostles. Before the apostles died, some of the early churches were deeply corrupted, including Sardis and Laodicea (Rev. 2-3), and within 200 years, most of the apostolic churches were totally apostate. The apostle Paul taught that false teachers will increase throughout church history (2 Timothy 3:13). 10. Two major programs are operating throughout church history: God’s program and the devil’s, Christ’s Great Commission and the devil’s Mystery of Iniquity. This can be illustrated with the first two parables in Matthew 13. These parables describe “the mystery of the kingdom of heaven” (Mat. 13:11), which is the peculiar form of the kingdom of God in the church age. The New Testament term “mystery” refers to truth not revealed in the Old Testament but revealed in the New (Eph. 3:4-5). The first parable, the Parable of the Sower, describes God’s plan for the church age, which is the sowing of the gospel (Mat. 13:18-23). God’s main work in the church age is the preaching of the gospel to the ends of the earth and the building of sound churches as the pillar and ground of the truth (Mat. 28:19-20; 1 Tim. 3:15). God’s work consists of a pure gospel, right doctrine, faith, hope, holiness, righteousness, love, humility, and justice. The second parable, the Parable of the Tares, describes the devil’s plan for the church age, which is the sowing of error (Mat. 13:24-30). The devil’s work consists of lies, false gospels, false teaching, apostasy, witchcraft, rebellion, sensuality, pride, doubt, agnosticism, and atheism.